It was the hardest winter in the sixty-plus year history of our family ranch. Record rains, snow and freezing weather many times from December through early March. The extremely abnormal weather put a big stress on the pregnant mama cow’s right at the time they were ready to give birth. We had several cows with newborns that needed a stay at “Hotel Corral” where they had shelter, extra hay and room service (high protein grass pellets) delivered in the morning by yours truly. We had four calves who lost their mothers from complications pre-or-post birth and a young first-calf heifer who we had to help give birth, pulling the calf as she pushed. Its head was too big and both could have died. Thankfully they are doing great now. I helped bottle feed the calves, massage them, encourage them to walk and love them. Being in close relationship, I began to recognize the unique soul signature of each calf, cow or bull just like I see my dog and humans. It was emotionally hard to witness them suffer, while doing all we could to help. It brought up a lot of questions for me. I’ve always felt good about the way our family raises cattle organically, the old-fashioned way. Lots of room to roam, graze and in winter hay cut from our own non-chemically treated fields. Now I was asking myself uncomfortable questions. What is my relationship with eating meat? How did humans become so detached from the source of their food? And what is my soul agreement with each of the calves who I know are being raised to be someone’s dinner in a couple of years? Hard realities for a cattle rancher’s daughter to look at after being away from it for 25 years. I bonded and had a soulful relationship with each of these calves. My soul agreement was to love them and care for them while learning the signs of health and illness. These vulnerable orphans taught me about bonding, showed me what their souls were interested in experiencing by being born as a cow or bull, and helped me surrender, what is out of my control, a little more. I used my energy tools to give healing to each of the calves and their mamas. I became particularly attached to a calf I named Teardrop, whose mom died when he was four days old. On his white face, he had a little black teardrop mark by his right eye (he’s pictured in this post). 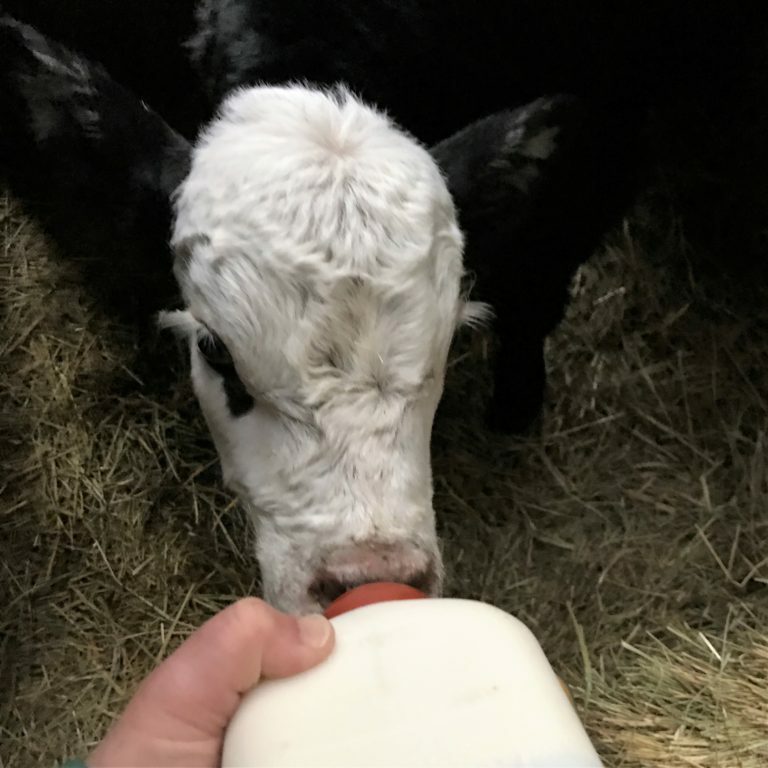 It is a rare occurrence to have a bottle-fed-calf at our ranch. We aren’t set-up for it long-term. So Dad ran an ad on craigslist to find someone interested in bottle calves, typically it’s a 4H kid. I prayed that whoever would come for the bottle calves would give them a good home. The next day a couple came out to take a look at Teardrop and decided to take his buddy too. They have a big cattle ranch in Montana (not a feed lot) with mother cows who had lost calves. They planned to match these calves up with new mamas, using the method my grandpa used long ago to get the mother cows to accept a calf that isn’t their own. While I know, their ultimate fate hasn’t improved, this is the best possible scenario for the days they get to enjoy being a soul in a calf’s body. As I explore my soul agreements with animals and that responsibility, I am learning from my ranch experiences that even if my encounter is brief, I have an opportunity to honor each unique soul and offer love. Hi Melisa, Miss you to and happy to see your life looking so joyous! your dad is really important. Thank you, Natalie. Have you seen Temple Grandin movie on netflix? I think you’re going to love it… the teachings all around. Thank you for sharing your story here. Ahva, I haven’t seen Templ Gradin’s movie yet but I will look it up! Thanks for the suggestion.